Thousand Oaks Chess Club – Come out and play a game with us! Welcome to the Thousand Oaks Chess Club! We meet from 6:00 p.m. to 8:45 p.m. every Monday evening. Our main events are continuous USCF rated tournaments. They are usually 5 rounds and are split into 3 or 4 sections according to rating, with one tournament round played per week. We also hold blitz tournaments about four times/year and the occasional other special event. To see when our next tournament begins, check out our Calendar. Detailed info for each tournament is posted about 2 weeks before the event begins in the News column. Click here to follow our current tournament in progress! 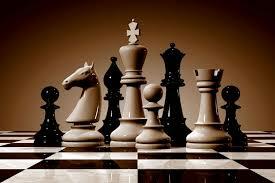 We have a chess store at the club where equipment such as sets, clocks, and scorebooks are available for purchase. All levels and ages are welcome, and we currently do not charge any membership fees. Feel free to stop by and check us out! We look forward to meeting you!